SOUTH KOREA: Kim Jong Un has agreed to hold a second summit with US President Donald Trump as soon as possible, Seoul said Sunday, after Washington’s top diplomat held “productive” talks on denuclearisation with the North Korean leader in Pyongyang. Pompeo said “he agreed with Chairman Kim to hold the second US-North Korea summit at the earliest date possible”, South Korea’s presidential office said in a statement, although no specific time or location has yet been agreed. 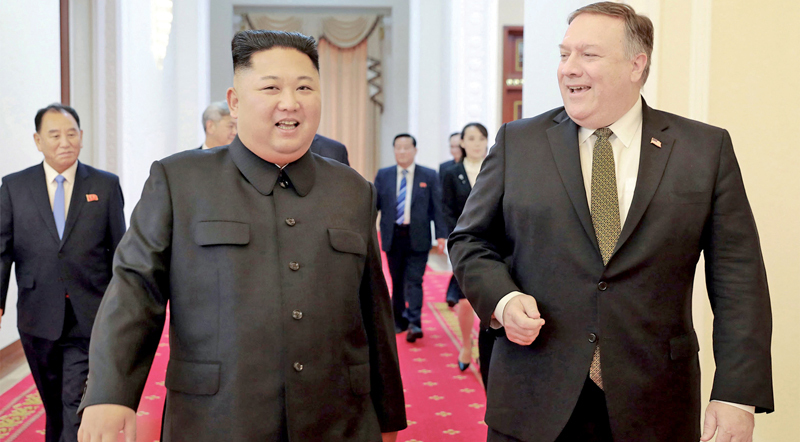 Pompeo and Kim also discussed “denuclearisation steps that will be taken by North Korea and the issue of attendance by the US government,” as well as “corresponding measures” to be taken by the United States, the statement said. Kim “expressed his gratitude to President Trump for making sincere effort” to implement the Singapore agreement, according to a report on the Pompeo visit by North Korea’s state news agency KCNA. “Kim Jong Un appreciated the positively developing situation on the Korean peninsula... (and) explained in detail the proposals for solving the denuclearization issue,” KCNA said. The North Korean leader also invited inspectors to visit the Punggye-ri nuclear test facility, which Pyongyang took apart in May, “to confirm that it has been irreversibly dismantled”, the State Department said. Kim praised their “nice meeting”, telling Pompeo via an interpreter following the morning’s talks that it was “a very nice day that promises a good future... for both countries”. Last month, the North’s foreign minister told the United Nations there was “no way” his country would disarm first as long as tough US sanctions remain against his country. After a previous visit to Pyongyang in July, Pompeo had said the two foes made progress on key issues -- but within hours of his departure the North condemned “gangster-like” demands from the US, raising questions over how much the two sides really saw eye to eye. An official on Sunday’s latest visit to Pyongyang with Pompeo said the trip was “better than the last time”, but added: “It’s going to be a long haul.” Following his arrival in Seoul from Pyongyang on Sunday, Pompeo said at a meeting with South Korean President Moon Jae-in that he had “a good productive conversation” with Kim, in talks which represented “another step forward”. “We can’t rule out the possibility that Washington... may move in the direction of partial easing of sanctions based on progress in denuclearisation,” he said. In exchange, the United States would declare a formal end to the 1950-53 Korean War -- which concluded with an armistice rather than a peace treaty -- but North Korea would stop short of delivering an exhaustive list of its nuclear facilities, she said. After Seoul, Pompeo ends his trip Monday in China, North Korea’s political and economic lifeline.